Saturday afternoon we were driving back from the country and started talking about D&D. The road was nice and clear, sun was shining down, so we were both getting sleepy. I started the conversation with "I like side initiative, because it's easier for me DMing". I then on to explain exactly how it worked. I also talked briefly about the last Fifth Ed battle I had, and the weird rotating initiative that happened. 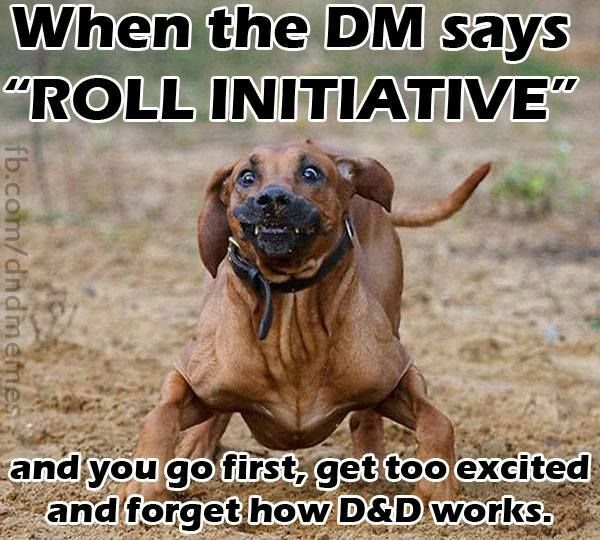 I should start off by saying normally what I/We do with D&D is roll initiative once, and then that's the order for the entire battle. The monsters all go once, not individually. The last battle I was so confused because there was different initiative's for most of the monsters, so when I thought it was my turn, we still hadn't actually finished a round. Side note: I can't believe they got rid of turns. Anyways, Apparently (as per Wife) she really likes the separate rolls for everyone, it's "part of the fun". So despite how much I'd prefer to just have one side go, and then the other I think I'll have to stick with individual initiative. Another thing I'm going to have to stick with is, the full scale +5 to -5 attribute modifiers, as another player really enjoys the swinginess of it. 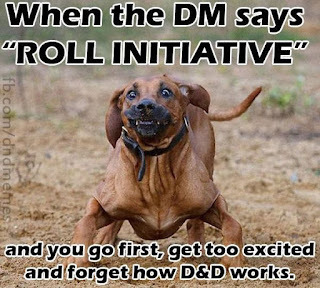 My solution for initiative is the following: Everyone rolls a d10 instead of a 20. Part of the reason is the countdown, with a pile of people who had A.D.D. "Alright who is 16??? no one???" "wait! i'm 16". You see how that's wildly problematic. So I think what I'll do is d10 plus dex bonus. In case of a tie, whoever has the highest dex goes first. In the case of a tie with monsters, I'll roll their dex score and see where it falls. I'm not sure if that will speed things up or not? But I'm going to give it a go the next time we play some elf games. Sometimes I can be swayed, which is a good thing. You have to listen when you run games. Alright that's it for me! Sometime this week I got a review I'll be doing, as well I'll probably do a friday catch up of the April TTRPG maker thing.